"Medicine 2.0" (ISSN 1923-2195, Medline Abbreviation: Med 2 0) is the official proceedings publication of the Medicine 2.0 Congress (World Congress on Social Media in Health, Medicine, Health, and Biomedical Research), and other events, workshops and tutorials promoted under the Medicine 2.0 label. Since July 2014, all Medicine 2.0 papers are now in PubMed Central and indexed in PubMed. Conference organizers interested in promoting a new conference or their existing workshop/tutorial/event series under the Medicine 2.0 label and making it eligible for publication in a Pubmed indexed Proceedings volume, please contact us. We currently only accept submissions from presenters at Medicine 2.0 conferences and workshops promoted at www.medicine20congress.com. (event organizers interested in promoting their workshop/tutorial/event under the Medicine 2.0 label and making it eligible for publication in a Pubmed indexed Proceedings volume, please contact us). Presenters at Medicine 2.0 events are eligible to submit short proceedings papers, free of charge (copyediting charges are optional). For details see Online Submissions instructions. Full-text articles are XML tagged using the NLM-DTD, archived in PubMed Central and indexed in PubMed. Background: The rise of technology has changed how people take control of their health, enabling individuals to choose to live healthier lives and make better treatment decisions. With this said, the Internet has emerged as the channel used by individuals for actively seeking or passively receiving health information. Objective: To explore how young adults assess the quality of health information, and how they construct meaning of online health information in general. Through 50 in-depth interviews, this study aims to examine how and why young adults turn to the Web for health information, and what strategies they employ to ensure that they are getting credible information. Methods: A total of 50 in-depth interviews were conducted with young adults to explore how they make meaning of online health information. Depending on the geographic area of the participant, the interview took place face-to-face at a location convenient for them, over Skype, or over the telephone and lasted on average 40 minutes. The interviews were transcribed verbatim, fully retaining the speech style of the moderator and the participants. Data were analyzed using techniques from the grounded theory approach, using a constant comparative method to allow for themes to emerge from the transcripts. Results: The participants shared several benefits to this mode of health information seeking, claiming that it made for more productive visits with doctors and made health information more readily accessible through a variety of different formats. 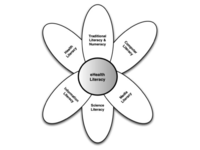 Additionally, the participants demonstrated their e-health literacy levels by discussing how they assessed online health information, engaging in a series of strategies that encompassed different aspects of e-health literacy. Social media channels were brought up by the participants as relatively new tools that can be used to assist in the seeking, understanding, and sharing of health information. However, participants also cautioned about the use of social media in regards to its informal nature, warning users to evaluate sources accordingly and to use these channels as supplementary outlets of information for more traditional channels. Conclusions: The use of the Internet and technology for health purposes is a growing area for both scholarship and practice that has strong implications for health consumers, medical professionals, and communicators alike. The findings that emerged from this research demonstrated that the online space is an acceptable channel through which young adults can find and share information. However, in spite of the rising usage of social media by this particular group, the findings showed that they were hesitant and wary of the channel, not seeing it as a resource for health information but more of a channel for networking and entertainment. In spite of this, this study shows that the online health information seeking behaviors is an area that warrants further exploration. Mobile health (mHealth) facilitates linking patient-generated data with electronic health records with clinical decision support systems. mHealth can transform health care, but to realize this potential it is important to identify the relevant stakeholders and how they might be affected. Such stakeholders include primary stakeholders, such as patients, families and caregivers, clinicians, health care facilities, researchers, payors and purchasers, employers, and miscellaneous secondary stakeholders, such as vendors, suppliers, distributors, and consultants, policy makers and legislators. The breadth and depth of the mHealth market make it possible for mHealth to have a considerable effect on people’s health. However, many concerns exist, including privacy, data security, funding, and the lack of case studies demonstrating efficacy and cost-effectiveness. Many American and European initiatives to address these concerns are afoot. Background: Internet is used for a variety of health related purposes. Use differs and has differential effects on health according to socioeconomic status. Objective: We investigated to what extent the Norwegian population use the Internet to support exercise and diet, what kind of services they use, and whether there are social disparities in use. We expected to find differences according to educational attainment. Methods: In November 2013 we surveyed a stratified sample of 2196 persons drawn from a Web panel of about 50,000 Norwegians over 15 years of age. The questionnaire included questions about using the Internet, including social network sites (SNS), or mobile apps in relation to exercise or diet, as well as background information about education, body image, and health. The survey email was opened by 1187 respondents (54%). Of these, 89 did not click on the survey hyperlink (declined to participate), while another 70 did not complete the survey. The final sample size is thus 1028 (87% response rate). Compared to the Norwegian census the sample had a slight under-representation of respondents under the age of 30 and with low education. The data was weighted accordingly before analyses. Results: Sixty-nine percent of women and 53% of men had read about exercise or diet on the Internet (χ2= 25.6, P<.001). More people with higher education (71%, χ2=19.1, P<.001), reported this. The same gender difference was found for using Internet-based interventions with 20% of women compared to14% of men reporting having used these interventions (χ2=7.9, P= .005), for having posted a status about exercise or diet on Facebook or other SNS (23% vs 12%, χ2=18.8, P<.001), and for having kept an online exercise or diet journal (21% vs 15%, χ2=7.0, P=.008). Evaluations of own physical appearance accounted for some of the gender differences in using online exercise or diet journals. Seven percent of the total sample reported having used electronic communication to ask professionals about exercise or diet, while a few more had discussed online with peers (10%). Asking professionals online was more common amongst those with only primary education (13%, χ2<10.5, P=.005). Conclusions: Gender and education are related to how the Internet is used to support health behaviors. We should be aware of the potential role of the Internet in accelerating social disparities in health, and continue to monitor population use. For Internet- and mobile-based interventions to support health behaviors, this study provides information relevant to tailoring of delivery media and components to user. Background: The World Wide Web has changed research habits, and these changes were further expanded when “Web 2.0” became popular in 2005. Bibliometrics is a helpful tool used for describing patterns of publication, for interpreting progression over time, and the geographical distribution of research in a given field. Few studies employing bibliometrics, however, have been carried out on the correlative nature of scientific literature and Web 2.0. Objective: The aim of this bibliometric analysis was to provide an overview of Web 2.0 implications in the biomedical literature. The objectives were to assess the growth rate of literature, key journals, authors, and country contributions, and to evaluate whether the various Web 2.0 applications were expressed within this biomedical literature, and if so, how. Methods: A specific query with keywords chosen to be representative of Web 2.0 applications was built for the PubMed database. Articles related to Web 2.0 were downloaded in Extensible Markup Language (XML) and were processed through developed hypertext preprocessor (PHP) scripts, then imported to Microsoft Excel 2010 for data processing. Results: A total of 1347 articles were included in this study. The number of articles related to Web 2.0 has been increasing from 2002 to 2012 (average annual growth rate was 106.3% with a maximum of 333% in 2005). The United States was by far the predominant country for authors, with 514 articles (54.0%; 514/952). The second and third most productive countries were the United Kingdom and Australia, with 87 (9.1%; 87/952) and 44 articles (4.6%; 44/952), respectively. Distribution of number of articles per author showed that the core population of researchers working on Web 2.0 in the medical field could be estimated at approximately 75. In total, 614 journals were identified during this analysis. Using Bradford’s law, 27 core journals were identified, among which three (Studies in Health Technology and Informatics, Journal of Medical Internet Research, and Nucleic Acids Research) produced more than 35 articles related to Web 2.0 over the period studied. A total of 274 words in the field of Web 2.0 were found after manual sorting of the 15,878 words appearing in title and abstract fields for articles. Word frequency analysis reveals “blog” as the most recurrent, followed by “wiki”, “Web 2.0”, ”social media”, “Facebook”, “social networks”, “blogger”, “cloud computing”, “Twitter”, and “blogging”. 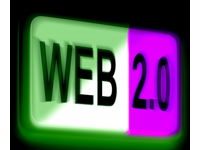 All categories of Web 2.0 applications were found, indicating the successful integration of Web 2.0 into the biomedical field. Conclusions: This study shows that the biomedical community is engaged in the use of Web 2.0 and confirms its high level of interest in these tools. Therefore, changes in the ways researchers use information seem to be far from over. Background: Mobile apps for people with diabetes offer great potential to support therapy management, increase therapy adherence, and reduce the probability of the occurrence of accompanying and secondary diseases. However, they are rarely used by elderly patients due to a lack of acceptance. Objective: We investigated the question “Which factors influence the acceptance of diabetes apps among patients aged 50 or older?” Particular emphasis was placed on the current use of mobile devices/apps, acceptance-promoting/-inhibiting factors, features of a helpful diabetes app, and contact persons for technical questions. This qualitative study was the third of three substudies investigating factors influencing acceptance of diabetes apps among patients aged 50 or older. Methods: Guided interviews were chosen in order to get a comprehensive insight into the subjective perspective of elderly diabetes patients. At the end of each interview, the patients tested two existing diabetes apps to reveal obstacles in (first) use. Results: Altogether, 32 patients with diabetes were interviewed. The mean age was 68.8 years (SD 8.2). 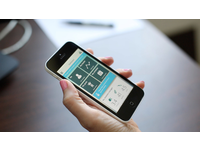 Of 32 participants, 15 (47%) knew apps, however only 2 (6%) had already used a diabetes app within their therapy. The reasons reported for being against the use of apps were a lack of additional benefits (4/8, 50%) compared to current therapy management, a lack of interoperability with other devices/apps (1/8, 12%), and no joy of use (1/8, 12%). The app test revealed the following main difficulties in use: nonintuitive understanding of the functionality of the apps (26/29, 90%), nonintuitive understanding of the menu navigation/labeling (19/29, 66%), font sizes and representations that were too small (14/29, 48%), and difficulties in recognizing and pressing touch-sensitive areas (14/29, 48%). Furthermore, the patients felt the apps lacked individually important functions (11/29, 38%), or felt the functions that were offered were unnecessary for their own therapy needs (10/29, 34%). The most important contents of a helpful diabetes app were reported as the ability to add remarks to measured values (9/28, 32%), the definition of thresholds for blood glucose values and highlighting deviating values (7/28, 25%), and a reminder feature for measurement/medication (7/28, 25%). The most important contact persons for technical questions were family members (19/31, 61%). Conclusions: A lack of additional benefits and ease of use emerged as the key factors for the acceptance of diabetes apps among patients aged 50 or older. Furthermore, it has been shown that the needs of the investigated target group are highly heterogeneous due to varying previous knowledge, age, type of diabetes, and therapy. 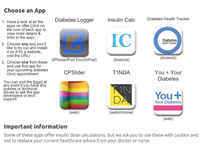 Therefore, a helpful diabetes app should be individually adaptable. Personal contact persons, especially during the initial phase of use, are of utmost importance to reduce the fear of data loss or erroneous data input, and to raise acceptance among this target group. Background: Traditionally, some teenagers and young adults with diabetes have not engaged well at diabetes appointments, giving rise to concerns about long-term health risks. We considered that apps might help this group of patients to improve preparation for, and therefore engagement at their appointments. Although there are already many apps for young people with type 1 diabetes (YPD), we thought that by supporting YPD themselves to develop apps, the resulting products would have greater “authenticity” and relevance. Objective: To test the feasibility of an online competition to (1) recruit and support YPD to develop apps (mobile or Internet based) to help prepare for clinic appointments, and (2) for these apps to be tested and rated by YPD. Methods: The “Diabetes App Challenge” was a United Kingdom (UK) national competition, run between June and October 2012 for teams including at least one YPD (aged 16-25) to pilot the design and development of apps for use by other YPD prior to clinic appointments. The competition was advertised by social media, email, AdWords and postings on the Diabetes UK website. Registrants for the competition were supported via email and discussion forum. 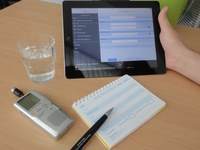 After app development, other YPD were invited (November 2012-February 2013) to trial the apps, choose and use one prior to a clinic appointment, and review their experiences. Results: Of 56 people (including 28 YPD) who expressed interest in the competition, 6 teams (14 people) developed and submitted an app. Two apps aimed to facilitate agenda setting in clinic consultations, 2 enabled data logging and 2 helped insulin dose calculation. Of 135 YPD who registered to trial the apps, 83 (61.5%) took part (mean age 18.98, 37/83 male). Agenda setting apps were considered most useful for preparing for and setting the focus of clinic appointments (P=.02). Just over half (46/83, 55%) said they would use their chosen app again and 4/5 (67/83, 81%) would recommend it to a friend. Conclusions: This competition to engage YPD in developing and reviewing apps proved successful. 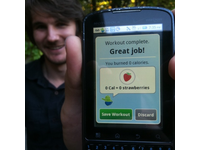 App designers and testers saw a need for a range of functions. However, this may, in part, reflect a lack of detailed knowledge of all existing apps and be limited by the technical skills of YPD. App competitions appear worth applying to other patient groups, but future competitions should include a review stage and perhaps focus on ideas for app design for subsequent professional implementation. Background: Health information technology, which is sometimes referred to as informaticization of medicine, is changing the extent to which patients become competent producers of their own health by enabling them access to health information anytime and anywhere. Objective: This research provides preliminary information on users' perceptions of the extent to which use of the Internet for health information impacts medical encounters. We specifically explored the following questions: (1) To what extent perceptions of positive or negative changes in medical encounters are associated with sociodemographic background of online health information seekers, and how often the Internet information is discussed with providers? (2) To what extent is there an association between perceived changes in medical encounters and frequency of referring to the Internet during medical encounters? (3) To what extent is there an association between sociodemographic background of online health information users and frequency of discussing of the Internet information with providers? Methods: The data for this study was derived from a national sampling of online health and medical information users who participated in the Study of Health and Medical Information in Cyberspace—Survey of User Perceptions (N=710). This study used a nationally representative online research panel of the US adults maintained by the Knowledge Networks. Analysis of variance (ANOVA), chi-square, and t tests were performed to examine the data. Results: Although Internet sources allow people the opportunity to gather health or medical information, discussion of this information was not a very common activity. It is noteworthy that half of the sample never or rarely discussed health/medical information obtained from Internet sources with health professionals. Chi-square analyses revealed that discussion of online health information with providers were associated with education, income, and marital status. We also found that discussion of the Internet information mostly promotes better physician-patient interactions. Analyses with post-hoc tests identified that perceived changes in medical encounters were associated with age, education, and income. However, 9.1% (64/703) of our respondents strongly agreed that the interactions with their providers have been strained. T test analyses showed that marital status, race, and gender were not significant. Conclusions: Embracing new technologies, and adapting to changing roles and relationships in delivery of medical care are critical to effective delivery of patient-centered care. Health professionals could also guide patients on how to evaluate information and where to access to reliable and accurate information. Background: Access to technologically mediated information and services under the umbrella of mental and physical health has become increasingly available to clients via Internet modalities, according to a recent study. 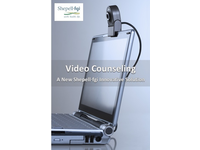 In May 2010, video counseling was added to the counseling services offered through the Employee and Family Assistance Program at Shepell·fgi as a pilot project with a full operational launch in September 2011. Objective: The objective of this study was to conduct a retrospective post launch examination of the video counseling service through an analysis of the reported clinical outcomes of video and in-person counseling modalities. Methods: A chronological sample of 68 video counseling (VC) cases and 68 in-person (IP) cases were collected from a pool of client clinical files closed in 2012. To minimize the variables impacting the study and maintain as much clinical continuity as possible, the IP and the VC clients must have attended clinical sessions with any one of six counselors who provided both the VC and the IP services. The study compared the two counseling modalities along the following data points (see glossary of terms): (1) client demographic profiles (eg, age, gender, whether the sessions involved individuals or conjoint sessions with couples or families, etc), (2) presenting issue, (3) average session hours, (4) client rating of session helpfulness, (5) rates of goal completion, (6) client withdrawal rates, (7) no show and late cancellation rates, and (8) pre/post client self-assessment. Specific to VC, we examined client geographic location. Results: Data analysis demonstrates that the VC and the IP showed a similar representation of presenting issues with nearly identical outcomes for client ratings of session helpfulness, rates of goal completion, pre/post client self-assessment, average session duration, and client geographic location. There were no statistically significant differences in the rates of withdrawal from counseling, no shows, and late cancellations between the VC and the IP counseling. The statistical analysis of the data was done on SPSS statistical software using 2-sample and pairwise comparison t tests at a 95% level of significance. Conclusions: Based on the study, VC and IP show similar outcomes in terms of client rating of session and goal attainment. Until recently, the Western biomedical paradigm has been effective in delivering health care, however this model is not positioned to tackle complex societal challenges or solve the current problems facing health care and delivery. The future of medicine requires a shift to a patient-centric model and in so doing the Internet has a significant role to play. 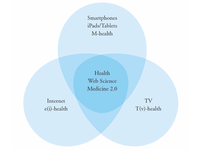 The disciplines of Health Web Science and Medicine 2.0 are pivotal to this approach. This viewpoint paper argues that these disciplines, together with the field of design, can tackle these challenges. Drawing together ideas from design practice and research, complexity theory, and participatory action research we depict design as an approach that is fundamentally social and linked to concepts of person-centered care. We discuss the role of design, specifically co-design, in understanding the social, psychological, and behavioral dimensions of illness and the implications for the design of future care towards transforming the patient experience. This paper builds on the presentations and subsequent interdisciplinary dialogue that developed from the panel session "Transforming Patient Experience: Health Web Science Meets Web 2.0" at the 2013 Medicine 2.0 conference in London. Background: Twitter is a social network where users read, send, and share snippets of text (“tweets”). Tweets can be disseminated through multiple means; on desktop computers, laptops, and mobile devices, over ethernet, Wi-Fi or cellular networks. This redundancy positions Twitter as a useful tool for disseminating information to the public during emergencies or disasters. Previous research on dissemination of information using Twitter has mostly investigated the characteristics of tweets that are most effective in raising consumer awareness about a new product or event. In particular, they describe characteristics that increase the chance the messages will be shared ("retweeted") by users. In comparison, little has been published on how information from municipal or state government agencies spreads on Twitter during emergency situations. Retweeting these messages is a way to enhance public awareness of potentially important instructions from public officials in a disaster. Objective: The aim of this study is to (1) describe the tweets of select New York State and New York City agencies by public officials surrounding two notable recent winter storms that required a large-scale emergency response, and (2) identify the characteristics of the tweets of public officials that were most disseminated (retweeted). 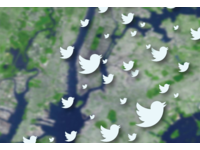 Methods: For one week surrounding Superstorm Sandy (October 2012) and the winter blizzard Nemo (February 2013), we collected (1) tweets from the official accounts for six New York governmental agencies, and (2) all tweets containing the hashtags #sandy (or #nemo) and #nyc. From these data we calculated how many times a tweet was retweeted, controlling for differences in baseline activity in each account. We observed how many hashtags and links each tweet contained. We also calculated the lexical diversity of each tweet, a measure of the range of vocabulary used. Results: During the Sandy storm, 3242 shared (retweeted) messages from public officials were collected. The lexical diversity of official tweets was similar (2.25-2.49) and well below the average for non-official tweets mentioning #sandy and #nyc (3.82). Most official tweets were with substantial retweets including a link for further reading. Of the 448 tweets analyzed from six official city and state Twitter accounts from the Nemo blizzard, 271 were related to the storm, and 174 had actionable information for the public. Actionable storm messages were retweeted approximately 24x per message, compared to 31x per message for general storm information. Conclusions: During two weather emergencies, New York public officials were able to convey storm-related information that was shared widely beyond existing follower bases, potentially improving situational awareness and disaster response. Official Sandy tweets, characterized by a lower lexical diversity score than other city- and Sandy-related tweets, were likely easier to understand, and often linked to further information and resources. Actionable information in the Nemo blizzard, such as specific instructions and cancellation notices, was not shared as often as more general warnings and “fun facts,” suggesting agencies mix important instructions with more general news and trivia, as a way of reaching the broadest audience during a disaster. 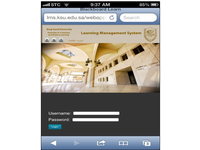 Background: Public universities in Saudi Arabia today are making substantial investments in e-learning as part of their educational system, especially in the implementation of learning management systems (LMS). To our knowledge, this is the first study conducted in Saudi Arabia exploring medical students’ experience with an LMS, particularly as part of a medical informatics course. Objective: This study investigates students’ use of various features of the LMS embedded in a recently implemented medical informatics course. Methods: A mixed methodology approach was employed. Survey questionnaires were distributed to all third year medical informatics students at the end of the course. In addition, two focus group sessions were conducted with twelve students. A thematic analysis of the focus group was performed. Results: A total of 265 third year medical student surveys (167/265, 63% male and 98/265, 37% female) were completed and analyzed. Overall, 50.6% (134/265) of the students agreed that the course was well planned and up-to-date, had clearly stated objectives and clear evaluation methods, appropriate course assignment, and that the LMS offered easy navigation. Most of the students rated the course as good/fair overall. In general, females were 10.4% more likely to prefer the LMS, as revealed by higher odd ratios (odds ratio [OR] 1.104, 95% CI 0.86-1.42) compared to males. Survey results showed that students’ use of LMS tools increased after taking the course compared to before taking the course. The full model containing all items were statistically significant (χ225=69.52, P<.001, n=243), indicating that the model was able to distinguish between students who had positive attitudes towards LMS and those who did not. The focus group, however, revealed that the students used social networking for general use rather than learning purposes, but they were using other Internet resources and mobile devices for learning. Male students showed a higher preference for using technology in general to enhance learning activities. 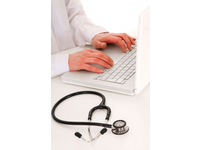 Overall, medical student attitudes towards the LMS were generally positive. Students also wanted a reminder and notification tool to help them stay updated with course events. Interestingly, a subset of students had been running a parallel LMS of their own that has features worth exploring and could be integrated with an official LMS in the future. Conclusions: To our knowledge, this was the first time that an LMS was used in a medical informatics course. Students showed interest in adapting various LMS tools to enhance their learning and gained more knowledge through familiarity with the tool. Researching an official LMS also revealed the existence of a parallel student-created LMS. This could allow teacher-led and student-led platforms to be integrated in the future for an enhanced student-centered experience. Background: There is an increasing social isolation among the elderly today. This will be an even larger issue in the future with growing numbers of elderly and less resources, for example, in terms of economy and staff. Loneliness and social isolation can, however, be addressed in several ways using different interactive eHealth services. Objective: This case study investigated novel eHealth services for the elderly, and their usage of a social interactive device designed especially for them. 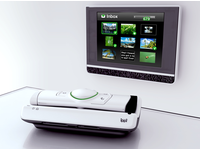 Methods: In this work, we used an innovative mobile communication device connected to the television (TV), which worked as a remotely controlled large interactive screen. The device was tested by 8 volunteers who visited a senior center. They were between 65 and 80 years of age and lived in their own homes. Throughout the 1.5 year-long project, 7 design workshops were held with the seniors and the staff at the center. During these workshops, demands and preferences regarding existing and new services were gathered. At the end of the project the participants’ experience of the device and of the services was elaborated in 3 workshops to get ideas for improved or new meaningful services. During the data analyses and development process, what seniors thought would be useful in relation to what was feasible was prioritized by the development company. Results: Regarding daily usage, the seniors reported that they mainly used the service for receiving information from the senior center and for communication with other participants in the group or with younger relatives. They also read information about events at the senior center and they liked to perform a weekly sent out workout exercise. Further, they played games such as Memory and Sudoku using the device. The service development focused on three categories of services: cognitive activities, social activities, and physical activities. A cognitive activity service that would be meaningful to develop was a game for practicing working memory. In the social activities category, the seniors wanted different quizzes and multi-player games. For physical activities, the seniors desired more workout exercises and suggestions for guided walking routes. A new category, “information and news”, was suggested since they lacked services like senior-customized global and local news. Conclusions: This study showed the importance of input from a group of seniors when designing new services for elderly citizens. Besides input to interactive eHealth service development for seniors, this study showed the importance of a social context around such work. The seniors were very engaged throughout the project and workshops were frequently visited and the seniors became friends. The high amount of input from the seniors could be explained in terms of social inclusion; they belonged to a group and each member was considered important for the work. The friendly workshop atmosphere facilitated new ideas and redesign of the services.